Are English clubs in Champions League decline? 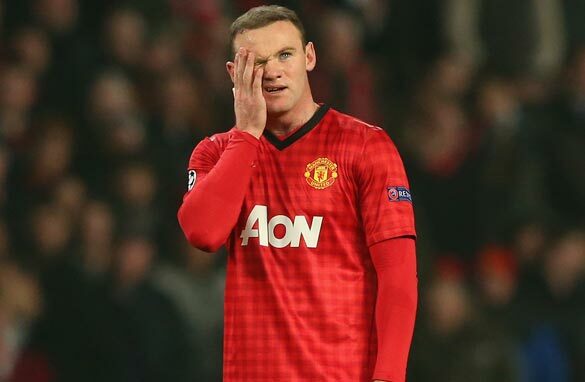 Wayne Rooney played a bit part as Manchester United were beaten by Real Madrid (Getty Images). Almost since its inception, the English Premier League has been lauded by many as the world’s greatest football division. Its mix of history, big-club glamor, international superstars, explosive on-pitch action and passionate fan support have combined to create a product that has fans in Singapore and Sao Paulo salivating as much as those in Salford, Manchester. However, proving which nation has the strongest top league on Planet Earth is a tricky task; there are so many factors on which to grade them. Whether it’s average attendance at games, money spent on players, the rate of big teams losing to small, goals per game, the ratio of Brazilians per club or whether the Beckham family can be found on the terrace, the options and methods with which to rank such leagues are as endless as the time it takes to decide a new Pope. Shining like a beacon of truth in this sea of confusion and befuddlement is the European Champions League, a competition whose allure and pedigree stands above all others in world soccer. It’s the elite club competition that has billionaire team owners, the smartest of tactician-managers and the world’s finest footballers straining every sinew to win. Lifting the big-eared cup is the ultimate confirmation of determination, skill and ingenuity applied consistently at home and abroad by a team that, by definition, has a sum value greater than its individual parts. Accordingly - and for many including this author - it is the litmus test for the quality of a national franchise: logic dictates that if domestic clubs progress well in the knockout stages they have been well-prepared by their week-to-week league opponents. By this measurement England has a reason to be fearful. This chart shows when English clubs have reached the quarterfinals, semifinals and final. If Arsenal get knocked out by Germany’s Bayern Munich (avoiding this would surely be a feat to rank alongside Arsene Wenger’s greatest), it will be the first time since 1996 the Champions League quarterfinals are without an English side. Bar Chelsea’s against-the-odds heroics, it would have been the same last year too. On the face of it this looks like a dramatic demise from the zenith of the 2007-08 season, when three English sides filled the four semifinal slots and Manchester United were crowned champions (the Lions of St. George presumably roared with satisfaction too). But it would probably be premature to write off the Premier League just yet. The fortunes of football teams are always subject to ebb and flow and it could be argued that English clubs are due an upswing soon. Chelsea are in a transition phase, with Rafa Benitez struggling to cope with a side that still needs to be shorn of ageing limbs. The London side have a very ambitious owner in Roman Abramovich and it is hard to see his spending spree ending anytime soon. Once a stable manager is in place, expect reinforcements and a reignition of European form to follow. England has had more teams in the quarterfinals, semifinals and final than any other country. Manchester United were close to knocking out one of the competition favorites Real Madrid last week, so they’re not in bad shape. As long as the health of Alex Ferguson continues and Wayne Rooney stays put, the Red Devils have minimal maintenance work (mainly in midfield and central defense) to compete in order to challenge again. Manchester City, another side backed with vast wealth, are finding their feet in Europe but have a squad of such strength and depth they will be more than capable of doing damage to Europe’s finest next season. The big question remains as to whether Roberto Mancini is the right man-with-the-plan? Probably not, in City's case. Arsenal have declined in recent seasons, just ask any Emirates season-ticket holder if you want confirmation. Their quality and superstar quotient is down on the high of the Thierry Henry-years, but they are a club who do have money to spend. Wenger faces the choice of loosening their purse-strings or being regularly usurped by London rivals Tottenham Hotspur. 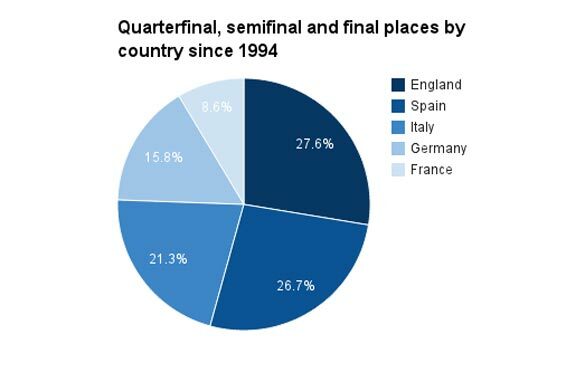 1) In terms of overall quarterfinal, semifinal and final appearances, England still outranks Spain, Italy and Germany. Only Spain can change this order this season, such is England's lead. 2) The Premier League has spending power that puts it top in transfer spending of European franchises for the last 10 years. In the modern game, success requires money and England has plenty of it. Interesting analysis. Football is cyclical and no doubt English clubs will bounce back. The probelm with English football is with the refereeing standards. The English referees for whatever reasons are scared stiff of Alex Ferguson or in some cases just plain in favor of Man United. So, little wonder that they had been winning the league for so many times. But when Fergie takes his team to Europe where the standard of referees are much higher, he just couldn't keep on winning like he did in England. On level playing field Man Utd, the so-called superpower of England looks like beginners.. Thanks to the likes of Howard Webb and others who just will ensure Man Utd win at all costs in BPL. by your logic, MU only wins because of refferees and therefore cant do well in Europe even though they were in 3 finals before the last one and have won twice under SAF. In all cases the reffs were non English. By your logic again, the other English teams must actually be good but have been hampered by biased refereeing. Therefore these teams should be doing better than United in Europe but they are not. Also MU held its own against Real who were very good, and only lost due to bad referreeing. So either way , your logic is not based on logic. Disagree, the refereeing in the EUROS have a tendency of favoring Spanish and Italian teams... its well known that Platini was a thing against English teams. Maybe not so much a decline in English clubs as much as there is an improvement in other European clubs out of Germany, France, Italy, Spain. Always will be until Exeter City (who play at the real St James Park) get into Europe meanwhile you'll have to put with what there is. 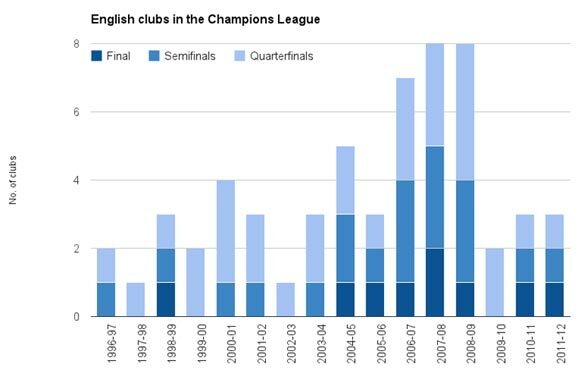 Are English clubs in decline in the Champions League? Hmm, in the last 10 years 3 different English clubs have won it, with Liverpool getting to 2 finals (winning 1), Arsenal reaching 1 (and losing to Barca), Chelsea reached 2 finals (winning 1), Man Utd reached 3 (won 1). In the same time Spain have had only 1 club in the final – Barcelona..
Italy 2 (Inter, AC Milan twice) – winning 2 between them. Let's not forget that only last season an English side won it. Barcelona, you could argue, yet again got a helping hand in the CL last night with the clearly offside 2nd goal. If that hadn't stood maybe they wouldn't have got through. They also got a helping hand against Arsenal a few years back with the Van Persie sending off for kicking the ball after the ref had blown the whistle – funnily enough the Barca player didn't get a ticking off for doing the same thing last night, when it was clear that play had ended. Then of course they were "lucky" in the game against Chelsea when the ref should have given at least 3 BLATANT penalties, and let Barcas goal stand even though there was a foul in the build up. Would Barca have reached as many finals in the last 6 years or so without some MASSIVE decisions going their way? Drogba sent off in the Nou Camp? English clubs have been in quite a few CL finals in the last 10 years, and lets not forget that for a period in the 70s and early 80s (until Heysel and the ban that followed) DOMINATED the European Cup. I get so tired of seeing MU and their fans whining about every call that goes against them. MU is the big revenue generator for Premiere League merchandise, for that it seems the they must be allowed to win at all costs so as to keep the sales and revenues flowing into the League. If MU really was as good as those who support them claim they are they would not lose in Europe as often as they do. It was so good to watch Barca humble them and expose the naivete of their fans, who's judgement of quality is a more suspect than they can admit. The only flaw in this debate is that the Premier league has existed since 1888. It's not a recent invention. All that has happened is more recently, they changed the name from Division One & renegotiated their TV contract. No Manchester, Liverpool or London teams. The Premier League is also about the smaller clubs, who lack the money to compete indefinitely, but come & go over time. I don't look at a few brief years, when judging Premier League standards. When you see the awful weather in England and generally the UK one wonders how the players can practise and hone their skills. Spain with its wonderful sunny climate is just perfect for football and all the best players want to go there and improve their skills. Messi would not be so great if he had to play in British weather and eat British food. I honestly think the EPL is overated thanks to their publicity and marketing budgets,but the truth is football was meant to a beautiful game not the cutthroat activity displayed in the English soccer fields. On second thoughts,EPL is capitalism at its very best. what else will you say of a league that has so many clubs been tag as ex champions league winner, man utd , aston villa, liverpool.nothiam forrest,chelseaand what else. English clubs must focus on homegrown players rather than buying expensive players from other countries which lead to their downfall. I mean 80% homegrown players and 20% imported players. The secret of modern football is the secret style of play or originality. so sad for ARS... my love!!! Like all sports persons, footballers playing in England are human. Their bodies and minds are over worked. Expectations from fans, media, club owners and paying masters keep soaring. Fixtures in the Capital One Cup, FA Cup, the hectic English Premier League, duty with their respective national teams – this is all hard labor. They falter on the way to a podium finish. In reply to @onemore fakefbpage, the Premier League was created in 1992, not 1888. Also Everton are from Liverpool. Liverpool FC only came about because of Everton leaving Anfield. Maybe you should do some research next time before you post. A lot of comments are not about football at all of course. They are bigoted comments against the English, and bigotry is no less repugnant when the English are the objects of it than any other group. That we had an "empire" does not excuse it. So did the French and the Spanish–worse, if anything. Nor does the fact that there are English bigots and racists excuse it. As for the football: most EPL teams ARE to all intents and purposes already foreign teams. Have commentators missed that. Van Persie, Hazard, Suarez, Silva, Tevez, Hernandez, Bale. I could go on. None are English. So in being bigoted against English teams, you're in effect confusing the "players" with your ugly stereotypes of the English.